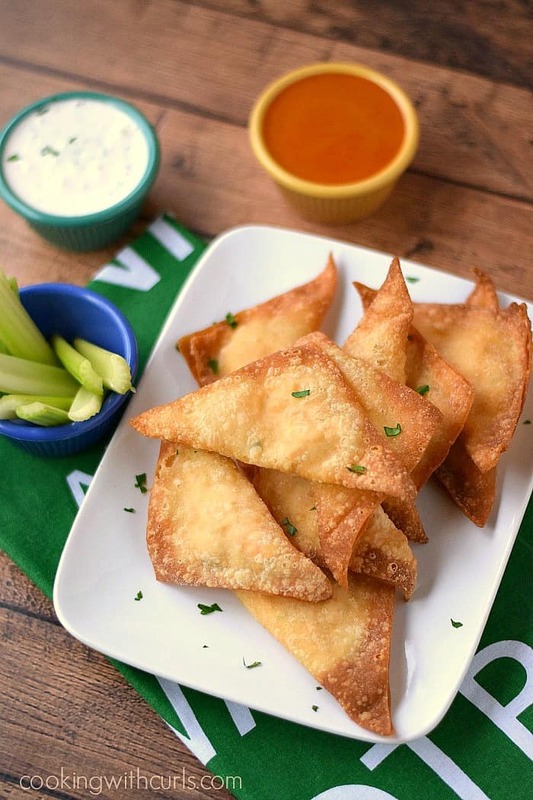 I have another fun appetizer for you today, Buffalo Chicken Rangoons! I have had this idea in my head since last year, and finally got around to making them happen. I hope you don’t mind, but I have decided to skip the traditional healthy foods of January and go straight to Super Bowl foods!! 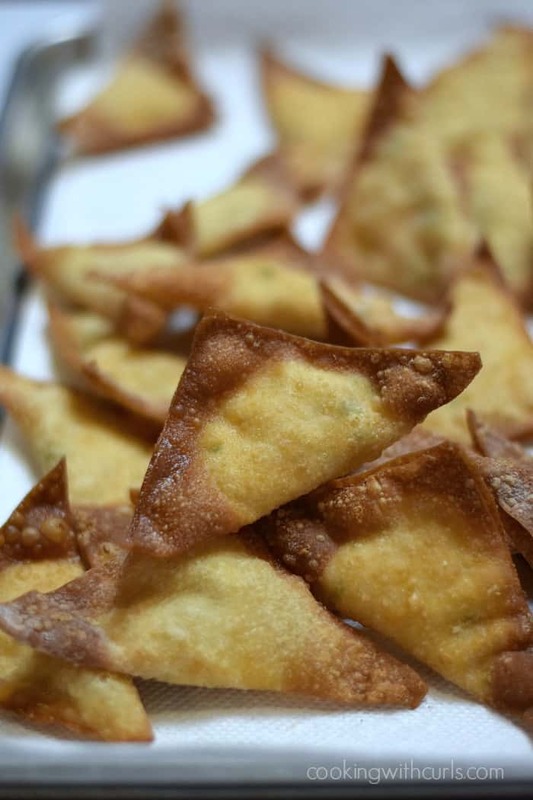 In case you are wondering why the are called rangoons and not wontons; Rangoons are an American creation made with cream cheese and usually crab. Won tons are a truly Chinese appetizer that is filled with pork and shrimp….no cream cheese! In fact, there is no cream cheese or dairy anywhere in Chinese culture. In a large bowl, mix together cream cheese, buffalo sauce, garlic, green onions until well combined. Stir in the chicken and crumbled blue cheese if using. I did not add the blue cheese, because I am allergic to it, but feel to give it a try. 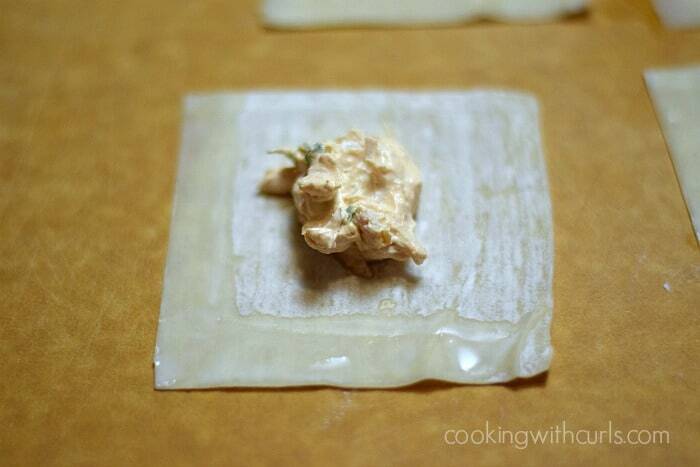 Place several wonton wrappers on a work surface. 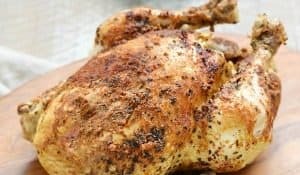 Place approximately 1 teaspoon of chicken mixture in the center of each wrapper…..
Rub water on edges of wrapper (use your finger)….. Fold wrapper over the filling to form a triangle. Squeeze out air bubbles and make sure you have a tight seal – you don’t want your filling to leak out while frying…..
Heat 1 to 1 1/2 inches of oil in the bottom of a Dutch oven or large stock pot until it reaches 350 degrees. 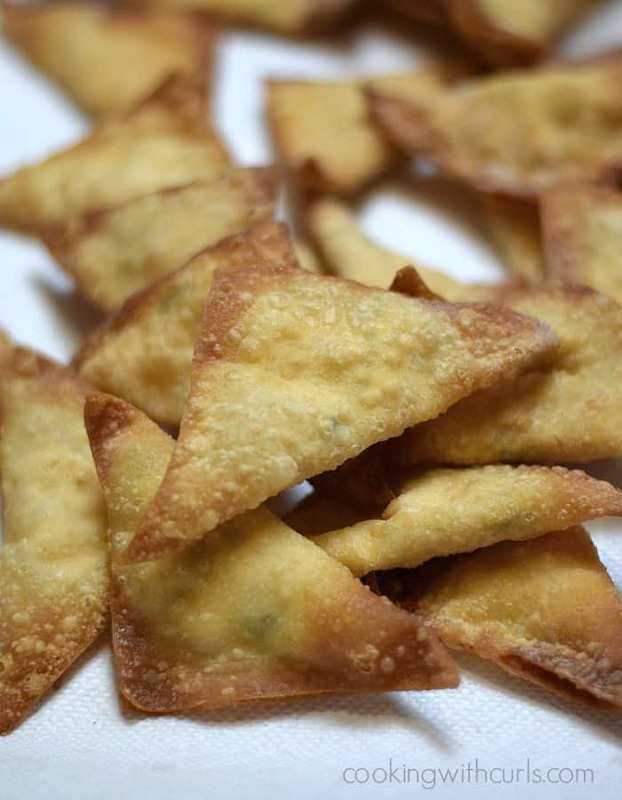 Carefully drop 3 to 5 rangoons at a time into the hot oil, do not overcrowd…..
Cook for about 3 minutes, flipping rangoons over so that both sides are golden brown. 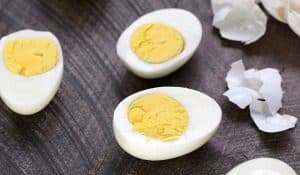 Remove from oil and allow to drain on a cooling rack or paper towels. Continue the process until you have cooked all of the rangoons….. 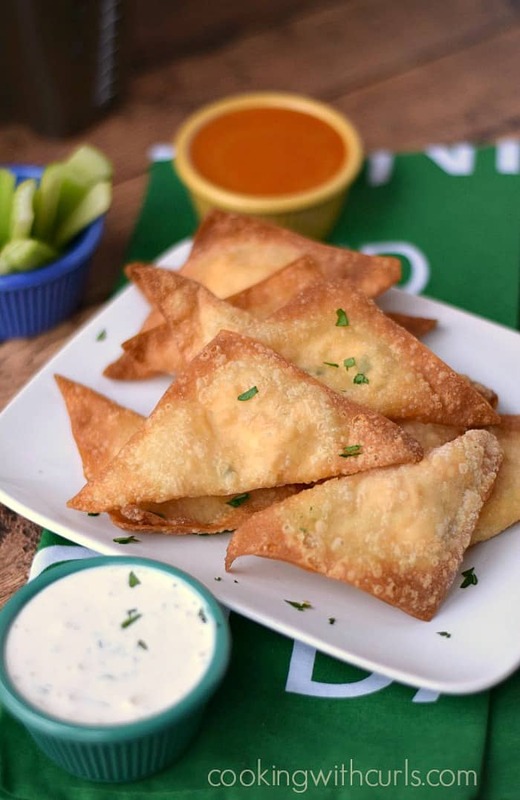 Serve with blue cheese dressing, celery sticks, and additional buffalo sauce…..
A quick tip about frying – Pay Attention to your temperature! 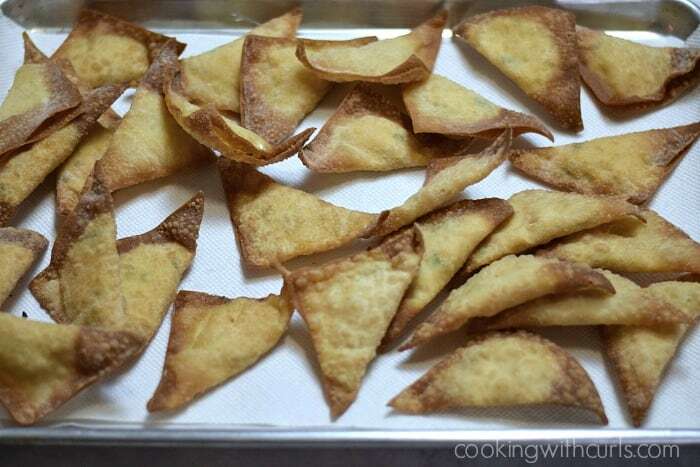 If the oil gets too hot, like say 400 degrees because you are not paying attention, your rangoons will cook too quickly and the edges will be very dark….. 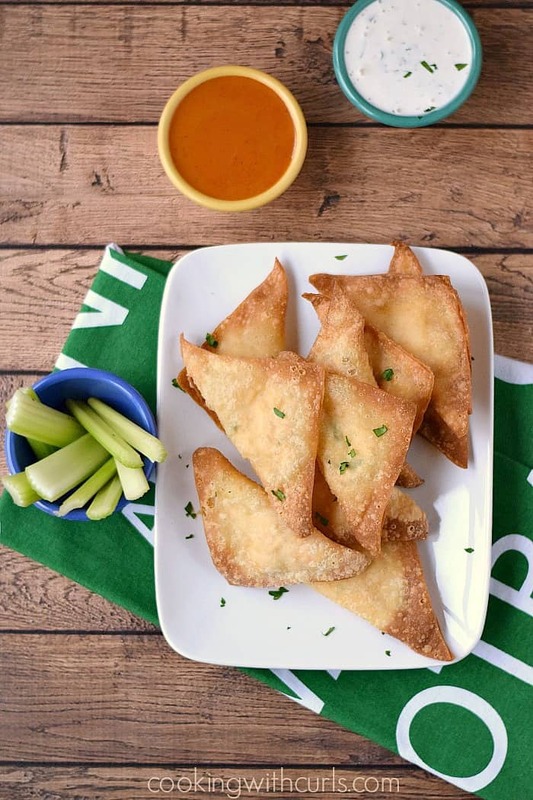 Turn down the heat as needed to keep the temperature as close to 350 as possible, and your rangoons will turn out golden brown…..
A spicy twist on my favorite appetizer, makes these Buffalo Chicken Rangoons perfect for game day! In a large bowl, mix together cream cheese, buffalo sauce, garlic, green onions. Stir in the chicken and crumbled blue cheese if using. Place four to six won ton wrappers on a work surface. 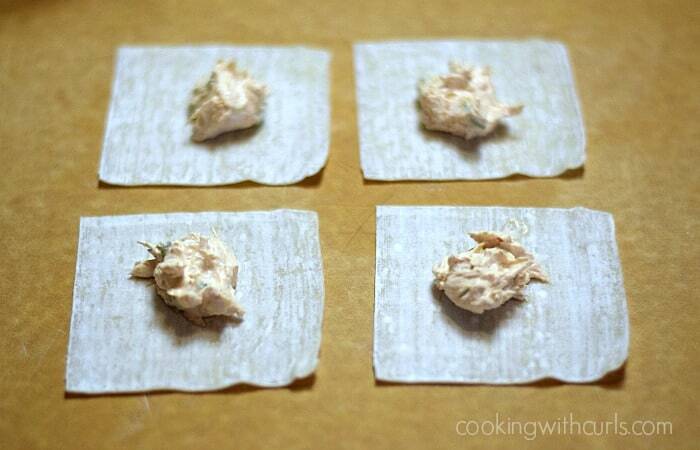 Place approximately 1 teaspoon of chicken mixture in the center of each wrapper. Rub water on edges of wrapper (use your finger). 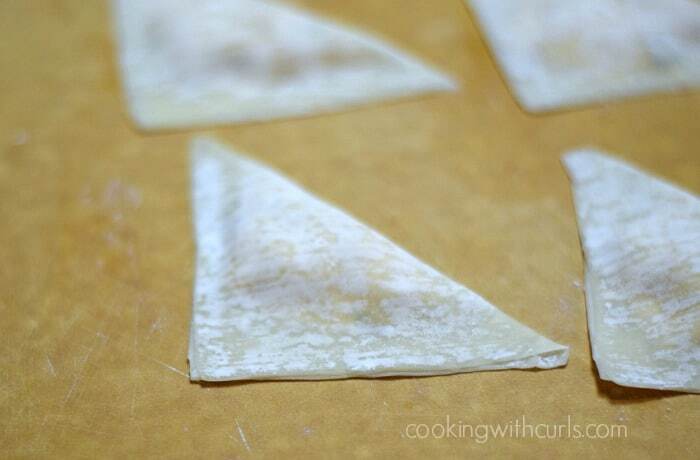 Fold wrapper over the filling to form a triangle. Squeeze out air bubbles and make sure you have a tight seal - you don't want your filling to leak out while frying. Set aside. Heat 1 to 1 1/2 inches of oil in the bottom of a Dutch oven or large stock pot until it reaches 350 degrees. 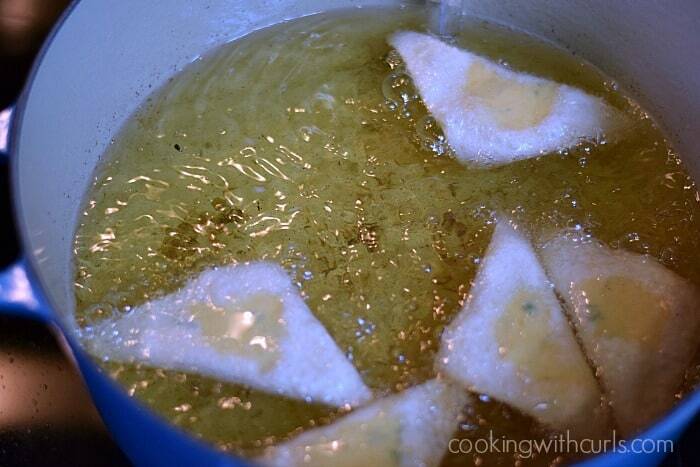 Carefully drop 3 to 5 rangoons at a time into the hot oil, do not overcrowd. Cook for about 3 minutes, flipping rangoons over so that both sides are golden brown. Remove from oil and allow to drain on a cooling rack or paper towels. Continue the process until you have cooked all of the rangoons. 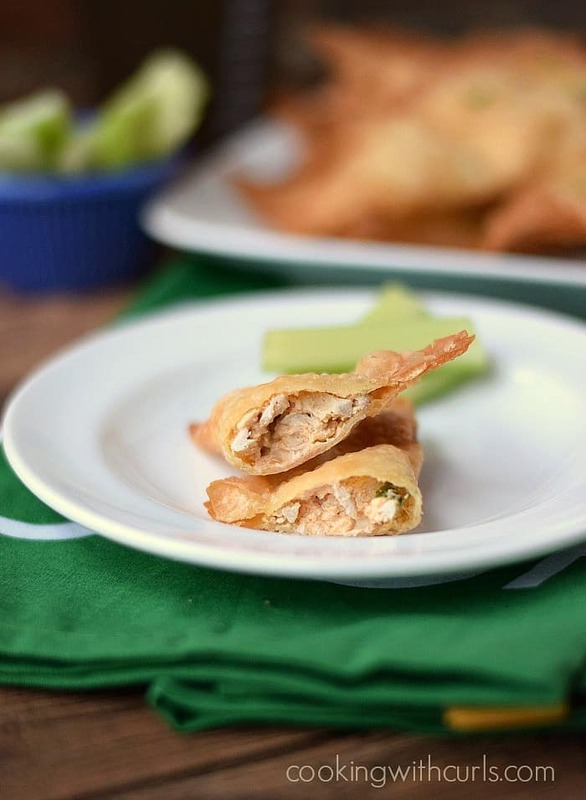 Serve with blue cheese dressing, celery sticks, and additional buffalo sauce. If you add the crumbled blue cheese, add additional buffalo sauce so it's not too dry, approximately 1/4 cup more. You will have anywhere from 35 to 45 rangoons, depending on how much filling you use in each one. OOooh! 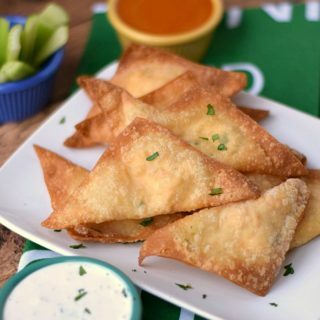 I like this Buffalo Chicken version of rangoons!! Perfect for game day!! These look terrific! and I thank you from the bottom of my heart for skipping the “healthy” recipes.There are plenty of places on the web to find “healthy” food. I want scrumptious and decadent. The boyfriend would absutely love these. I’m going to pin them for later this week. I hope your having a happy Sunday. I’m with Maralyn! These look so good Lisa!! Pinned! What a decadent treat! Thank you for sharing. Pinned! FABULOUS idea, Lisa! I love these and I need to get over my fear of frying. For these!!! I wish I had a fear of frying, I do it way too often!! 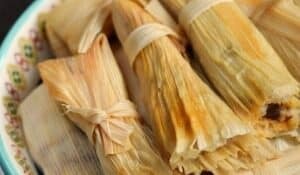 these sound delicious, and I just so happen to have all of the ingredients in the house right now. These look yummy! Perfect for game day!